However, the second quarter of the 19th century saw the emergence of the mass transit revolution. The new the horse drawn omnibuses were affordable to many people, unlike individual horses and horse drawn carriages. Over nearly all of the next century, transit shaped the city. Services were expanded and improved. Electric streetcars and interurbans appeared. If the Census Bureau had asked a "journey to work" question in the 1900 census, the answers would have shown transit's share of mechanized to be virtually 100 percent. But, just as the transit city was peaking, the car began its ascent, with automobile ownership expanding rapidly in the 1920s. By 1929, 90 percent of the world's car registrations were in the United States, according to Northwestern University economist Robert Gordon. All of this made it possible to travel farther in urban areas and to live even farther from the urban core. After the Great Depression and World War II, which slowed growth, automobile ownership expanded even more. By 1950, New York region's urban density had dropped below 10,000 per square mile and the average density among the principal urban areas in today's 53 major metropolitan areas (more than 1,000,000 population) was approximately 6,000 per square mile. By 2010, New York's urban density had dropped to 5,300, and Los Angeles had become the densest at 7,000. 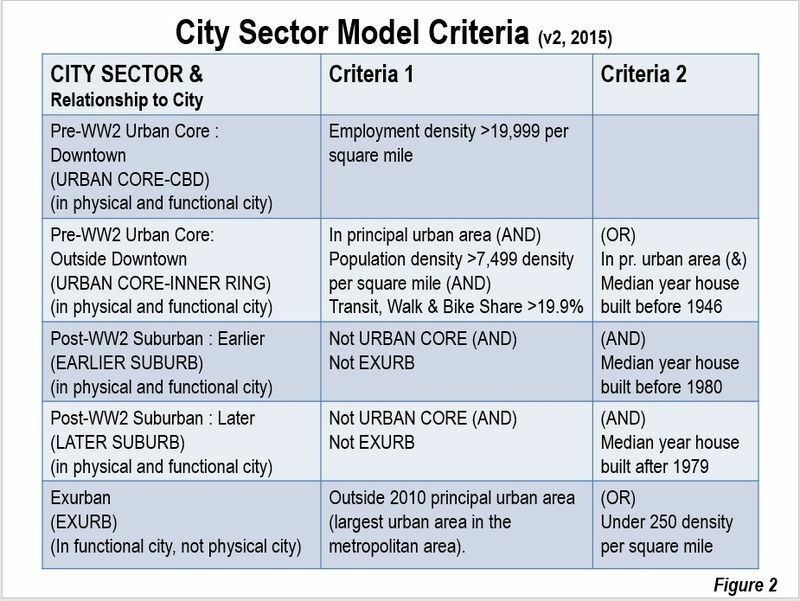 The average of the principal urban areas to 3,100. The dominance of the automobile ended much of the need for a CBD. 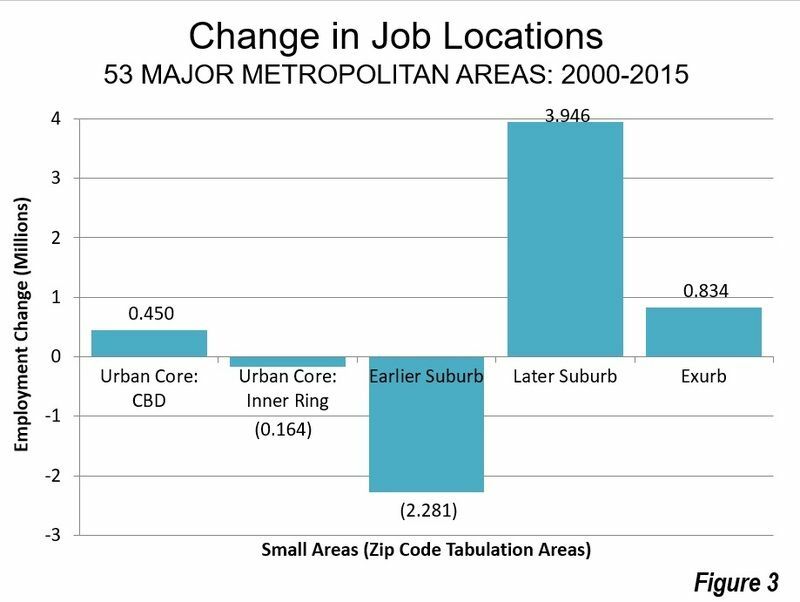 As people moved farther away (suburbanized), employment and commercial development also suburbanized. Large retail shopping centers appeared throughout the suburbs. Soon after, large employment centers developed outside the downtowns, such as Bellevue (Seattle), Uptown (Houston), Century City (Los Angeles) and Research Triangle (Raleigh-Durham). In 1991 Joel Garreau first brought centers like this to public attention, coining the term "edge city" in his book Edge Cities: Life on the New Frontier. It had become clear to those who were paying attention that the monocentric, CBD oriented US city was a thing of the past. There were still CBDs, of course, but most were shadows of their former selves in employment and shopping shares. American cities were increasingly referred to as "polycentric." But polycentricity did not last very long. In 1997, University of Southern California economists Peter Gordon and Harry W. Richardson noted the trend toward dispersion in Beyond Polycentricity: The Dispersed Metropolis, Los Angeles, 1970-1990. In a 1998 Brookings Institution paper, they highlighted one of the most important advantages of dispersion. Traffic “doomsday” forecasts, for example, have gone the way of most other dire predictions. Why? Because suburbanization has turned out to be the traffic safety valve. Increasingly footloose industry has followed workers into the suburbs and exurban areas and most commuting now takes place suburb-to-suburb on faster, less crowded roads." •	Among metropolitan areas with more than 3,000,000 residents, 77.9 percent of employment was dispersed, 15.0 percent in subcenters and 7.1 percent in CBDs. •	Among metropolitan areas with from 1,000,000 to 3,000,000 residents, 82.2 percent of employment was dispersed, 7.0 percent in subcenters and 10.8 percent in CBDs. 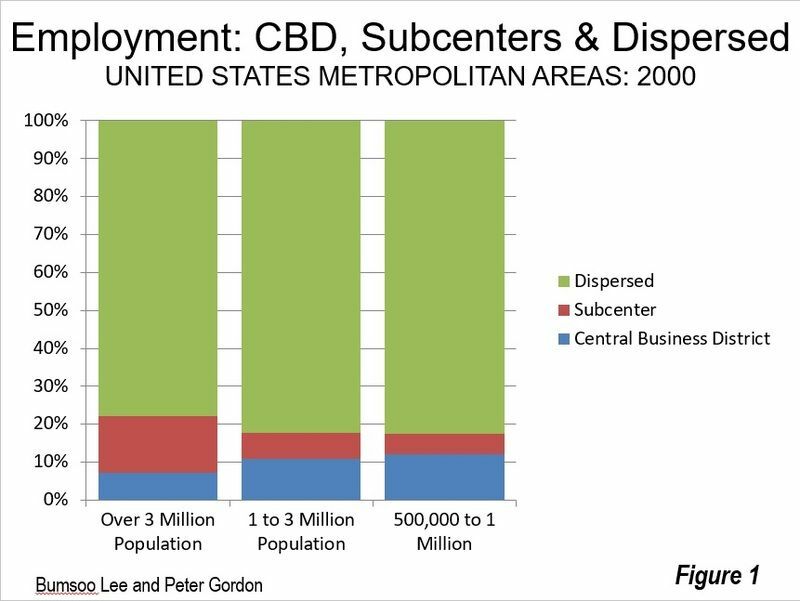 •	Among metropolitan areas with from 500,000 to 1,000,000 residents, 82.6 percent of employment was dispersed, 5.6 percent in subcenters and 12.2 percent in CBDs. This reality of the dispersed city, however, does not get in the way of media and others who talk as if the city remains monocentric. Yet in an era of new possibilities unleashed by technology --- Uber, Lyft, autonomous vehicles --- the likely trajectory is for more dispersion not less. Top photo: Los Angeles, CBD, polycentric (Wilshire district, Hollywood and Glendale) and dispersed (the rest), by author.